At nine months old, most babies are just starting to find their way in the world. They’re inquisitive, adventurous and maybe a little bit cheeky – and that’s exactly why we adore them. 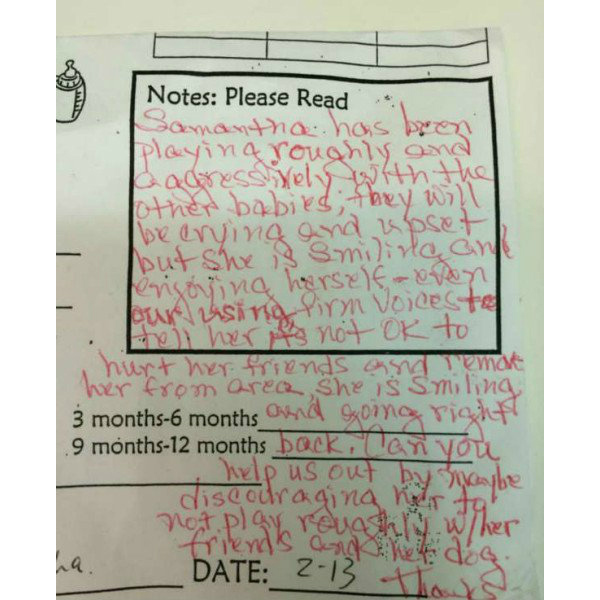 So what would you do if your daycare centre sent home this bizarre note about your healthy, happy baby girl? Wait, what? An “aggressive” nine-month-old BABY? Yep, that’s the note a mum purportedly received in the US from her daughter’s daycare. The justifiably upset mum posted it to a Facebook mum’s group, according to Babble. The condescending note appears to imply that she’s hurting other children maliciously because she smiles afterwards and is “enjoying herself”. Can babies be intentionally aggressive? Raising Children Network says children about that age are just beginning to learn cause and effect, which coincides with them suddenly being able to grab, tug and bite. “But she is still too young to be aggressive in the sense of intending to hurt,” it says. It says from nine to 12 months, pushing, grabbing or biting is usually a baby’s way of trying to get to or explore something. When they appear to show real anger, it may actually be fear or discomfort – for example because of separation from a parent or overstimulation in their environment. Child psychologist Dr Adelle Cadieux tells Babble it’s also common for babies to get frustrated because they can’t properly communicate their wishes. See? All pretty normal behaviour for a baby of that age. Dr Cadieux says it would have been more helpful for the educators to talk to the family rather than send home a vague note if they were noticing anything different to normal development. Raising Children Network says if parents are worried about their baby’s behaviour, they can try to anticipate their actions (such as biting, pulling or grabbing) and stop it – and then say firmly, without a smile, “no biting, that hurts”. It says babies want to please their parents, so the message will get through – but it may take a while if they have a particularly persistent personality.